One of our holiday apartments to rent on Royal Palm Tenerife. This penthouse apartment has great views across the ocean and also has a washing machine. We booked our apartment through Karen Durant from Holidays 4U. We were very pleased with the holiday and the service provided. Infact we have been coming to the Royal Palm complex for many years. It is definitely our favourite complex. Not a lot more needs to be said therefore. 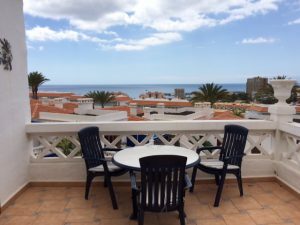 The apartment we booked had an amazing view from the balcony, across Los Cristianos and out over the ocean. We loved watching the ships and boats while sipping a cocktail and enjoying the sun on the balcony. The only downside is that the complex is up the hill. But if you are fit or don’t mind taking any of the plentiful taxis, then I would recommend the views are more than worth it. There are restaurants and supermarkets nearby, or of course plenty more down by the beach. There are 2 pools on the complex. One heated and one unheated. There is a sign to advise people that sun-beds cannot be reserved. This would be an advantage, were it not for the fact that everyone ignores the rule. We found that loads of people were leaving towels on the beds and disappearing for long intervals. It didn’t really bother us though. We thought the garden and communal areas of the complex were very well maintained. The apartment itself was like a home from home and very well equipped. There was even a cafetiere and an umbrella, which we didn’t use as the weather was glorious!